1 out of 5 Americans will develop skin cancer sometime during their lifetime. Over one million new cases of skin cancer are diagnosed every year in the U.S. Skin cancer can be deadly. 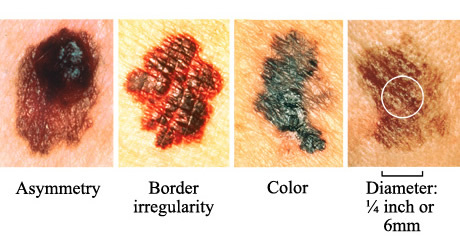 Melanoma, the dangerous form of skin cancer, can be very aggressive once it spreads from the skin. Melanoma kills over 8000 people in this country every year. Ultraviolet light from the sun causes skin cancer. Over 90% of all skin cancers are caused by the sun. When a person gets five sunburns, or one blistering sunburn, their risk of getting a skin cancer doubles. More sun exposure, including tanning, means a greater risk of developing skin cancer. Ultraviolet light from tanning booths causes skin cancer just like the ultraviolet light from the sun. In addition to causing skin cancer, ultraviolet light wrinkles the skin and makes a person look older than they really are. Skin cancer can be prevented with good sun protection. Protecting yourself from the sun does not mean staying indoors – it means taking a few extra steps to make sure your skin is safe. Early detection is key. The most important factor in the successful treatment of skin cancer is early detection and treatment. Catching a skin cancer early always makes it easy to treat, and for melanomas, early detection can be life-saving!